The role of T Mycoplasma (Ureaplasma urealyticum) in reproductive failure is controversial. Since mycoplasma was first isolated from a genital-tract abscess, an association between mycoplasma and various genital-tract conditions , reproductive failure, relative or absolute infertility has been suggested. Several investigators have shown that the relative frequency of T-mycoplasma colonization in the genital tract depends on the sexual experiences of the subject and that infertile couples tend to have higher colonization rates. Several claims were made previously that by eradicating the organism, doxycycline improved fertility and resulted in higher pregnancy rates in a group of couples with unexplained infertility. These findings were subsequently refuted by several other investigators who did not find a close correlation between doxycycline therapy and fertility. Four weeks with doxycycline, (100 mg twice a day) was given to both husband and wife. 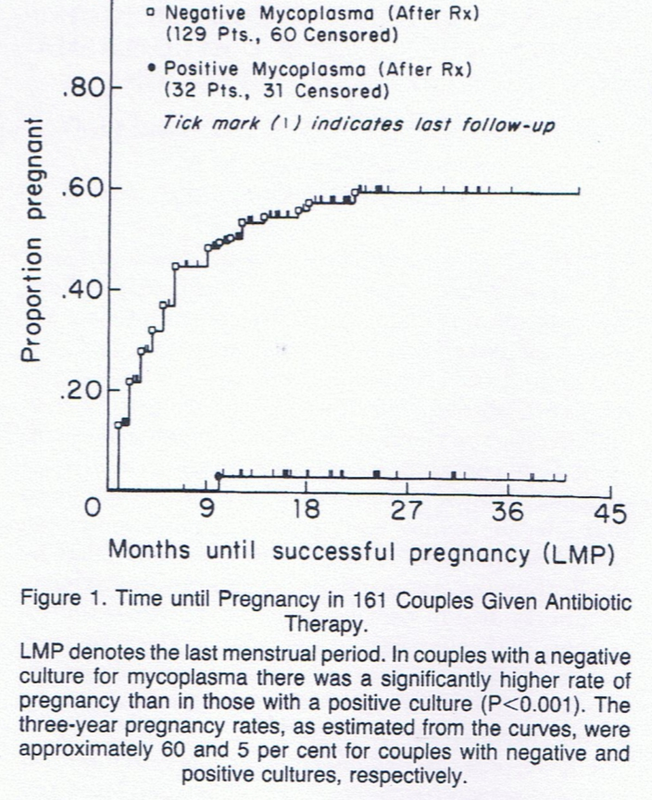 There was a significant association between post-therapy pregnancy status and post-therapy mycoplasma status (P<0.001). 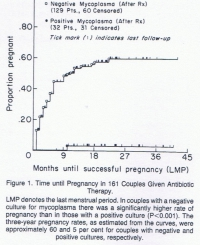 Among the couples who eventually had a successful pregnancy, almost all men (99 percent) were free of mycoplasma after the course of antibiotic therapy; only two thirds of the men in the group of couples that did not have a successful pregnancy had specimens that were negative for mycoplasma after therapy.